I was contacted yesterday by one of the producers with some information about the segment Killer Stand-up comedian Gid Pool will be featured in on the TODAY Show in May, 2012. That particular TODAY Show segment is called “Your Life Calling with Jane Pauley” and is produced and sponsored by AARP. You can find all segments of this TV series at www.aarp.org/Jane. 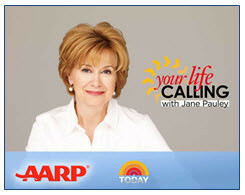 Jane Pauley is AARP’s contributor to the award-winning “Your Life Calling” series featured monthly on the NBC TODAY Show. Your Life Calling highlights people age 50+ from across the country who are trying new things – whether it’s starting a different career, learning new skills, changing how they live, or finally pursuing their dreams. A well-driller uses his talents to provide clean water to African villages, saving countless lives. A stay-at-home mom launches a new career as a successful home stager. A 49-year-old signs up to become an Army chaplain, ministering to troops on the front lines. An Alabama man uses his social security check to raise prostate cancer awareness in poor communities. A former filmmaker works to reform the Chinese orphanage system, bringing hope to thousands of children. A government worker hears the call of the wild and leaves her job to become a tour guide in Yellowstone. And in May, they will feature Gid Pool, a retiree who made the decision to become a stand-up comedian at age 61 (who is now 67 and his stand-up comedy career has taken off). As one of broadcasting’s most respected journalists, Jane Pauley has been a familiar face on morning, daytime and prime time television for more than 30 years. She served as the co-host of TODAY from 1976 to 1989, anchored Dateline NBC for more than a decade and in 2004 became the host of her own daytime program, The Jane Pauley Show. That same year, Pauley published her memoir, Skywriting: A Life Out of the Blue, which became a New York Times bestseller. Pauley is the recipient of numerous Emmy and other awards, including the prestigious Walter Cronkite Award for Excellence in Journalism and the Gracie Allen Award from the Foundation of American Women in Radio & Television. In her first collaboration with AARP in 2009, Pauley received a second Gracie Award for best national public affairs program with Picking Up the Pieces, a PBS TV special featuring families of soldiers returning from the wars in Iraq and Afghanistan. In addition, Pauley is a highly regarded advocate for mental health, children’s health and education issues. She and her husband, Doonesbury cartoonist Garry Trudeau, are the parents of three grown children. Needless to say, I am very excited for comedian Gid Pool and his opportunity to be featured on such a highly respected, award winning TV show! This entry was posted in Editorial and tagged AARP, comedy career, jane pauley, nbc today, stand up comedian, stand up comedy by Steve Roye. Bookmark the permalink. Hmm Well I was just searching on yahoo and just came across your site, in general I just only visit sites and retrieve my needed info but this time the useful info that you posted in this post urged me to post here and appreciate your diligent work. I just bookmarked your site. Thank you again.